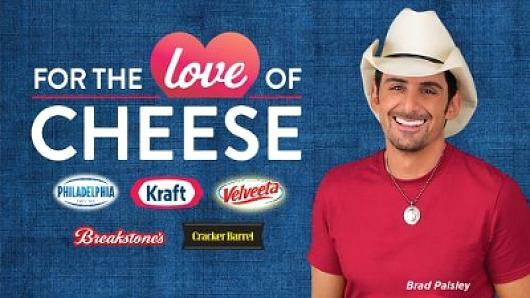 Kraft enrolled country music superstar and self-proclaimed cheese-lover, Brad Paisley to help spread the cheese love across the country. The brand is sponsoring his 2014 World Tour which kicked off in Philadelphia. Concert-going fans can show their love of cheese in a variety of fun and engaging ways, including the opportunity to take part in Kraft’s “Cheese-loving Karaoke,” where fans can sing along to some of Paisley’s biggest hits. Fans can go online to enter into a national sweepstakes for a chance to win a lifetime supply of cheese and a VIP Brad Paisley concert experience, find Paisley’s cheesy recipe favorites, and watch humorous videos featuring Brad Paisley. Pop up on signage and promotional displays will feature Brad Paisley in more than 25,000 grocery stores nationwide. Learn more about “For the Love of Cheese” here.